Nowadays, exercise is a major part of life. Over the years, exercise and workout routines have evolved. People have also adapted to different forms of calisthenics to improve their body shape and physical well-being. Fitness experts have also developed various routines and nutritional implements to match every person’s physical capabilities. Recently, marathons or triathlons have steadily become a fad for a lot of fitness fans. It is because of the various forms of activities involved in the event that tests a person’s physical tolerance. Perhaps we’ve been invited to join a marathon by our friends, or perhaps we’re determined to challenge our limits, or perhaps we’re already a marathon regular and have attended dozens of events. Whatever the reasons are, attending one is packed with plenty of benefits for ourselves and our health. Not only that, signing up for marathons can also do a lot of good in our lives on a personal basis. It helps us gain a new hobby, feel more confident, earn new friends, discover new places or routes, get a medal and of course, help support a worthy cause. Trying to tackle a half-mile marathon even during practice will not be a good thing if it is your first time. Chances are, you’d get severely exhausted and also injure yourself in the process. Make sure to run distances that you can manage without overtiring yourself weeks before the event until you can finally do longer distances. Our diet is essential to our success in completing a marathon. Make it a point to eat foods that is healthy especially the ones loaded with healthy carbs, healthy fats, lots of protein, and vitamins to strengthen immunity, muscles and respiratory system. Doing this is especially important before the marathon. Always include foods like green and leafy vegetables, lean meat, nuts, dairy products, fish in your meals. It’s impossible to run in walking shoes or slippers, so it is important to buy equipment that is comfortable while optimizing your performance for the marathon. This includes running shoes, dri-fit shirts, shorts or stretchy pants. 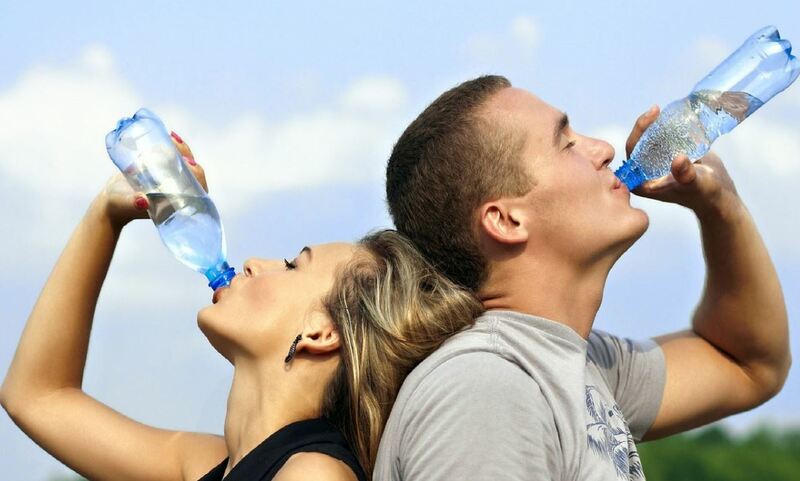 Without a doubt, drinking an ideal amount of water is imperative any time before, during and after the marathon. This is to ensure you stay hydrated during your rigorous training. Most of the time, supplements can fill in the void of nutritional deficiency from the food we eat. You can purchase these in health stores or buy high-quality products online. Keep in mind, though, that you need to check with your doctor first before taking these supplements to know that you are top health to take them safely. A supplement formulated for both men and women for post-workout. It is natural anabolic and helps cells and muscle to recharge faster with their advance recovery fusion. Helps gain strength and develop lean muscles. A high—quality hydration supplement with key minerals like Himalayan sea salt, coconut water and more. Contains premium electrolytes to optimize workouts and boost body performance. Helps in post-workout recovery and lessens cramping and dehydration during training. Formulated in a fruit punch flavor that’s sugar-free with no artificial dyes or fillers. High-quality capsules formulated to help post-workout recovery. Helps improve muscle and increases energy for performance improvement. Helps maintain healthy protein levels with amino acids for faster fat burning and muscle recovery. Full-range Amino Acids and Leucine for muscle recovery. Helps optimize digestive health with prebiotic fiber and digestive enzymes. Also helps speed up post-workout muscle growth. Comes in a yummy strawberry frozen fruit bar flavor with high electrolytes from ingredients like coconut water and Himalayan salt. An energy drink that’s immune-enhancing with low glycemic content. Contains Taurine and Glutamine for improved performance, recovery, and protection of muscles. High-quality supplement for joint health protection helps relieve the body from minor pains and aches. Contains vital amino acids for strong muscle development. It also helps restrain catabolic state. Formulated with no artificial flavors, sweeteners, and colors. Known as the best post-workout supplement around, it is well worth the price. A whey protein shake drink mix that’s hydrolyzed to nourish your muscles. It is the official supplement of many athletes and sportsmen worldwide. Produces incredible results and it also tastes great. Caffeine-free pre-workout supplement with nitric oxide booster and beta alanine and alpha GPC for improved performance before training. Keeps your energized without the caffeinated jitter and maintains optimized health. All added ingredients are natural and are scientifically proven to stimulate muscles. High-quality supplements that’s multi-purpose and complete. This supplement is packed with vitamins and minerals for immunity and strength, amino acids for healthy muscle growth and post-workout recovery as well as digestive enzymes. Used by world pros like top bodybuilders and athletes. Workout supplement in capsules that contain vitamin B6, magnesium, and zinc. It helps increase anabolic production and build muscles. It also helps build-up endurance and also heals muscle and boosts good sleep quality.